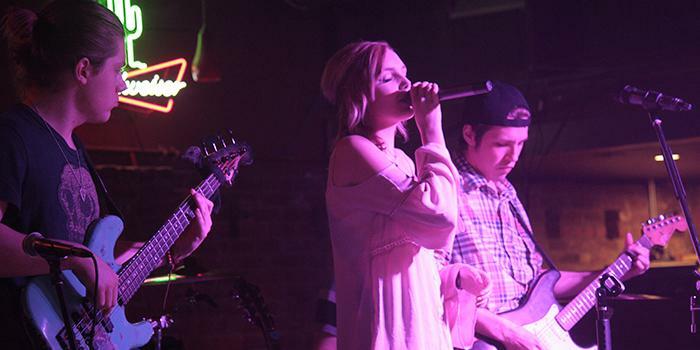 From left Tristan McNay bass guitar, Madison Hudson vocalist, Jesse Szabo gu playing Stony Friday night Febuary 13. American River College Students Jesse Szabo, Branden Coleman and Tristan McNay all have two things in common. They all attend ARC and they are all in the Madison Hudson country band alongside Sierra student and lead singer Madison Hudson. Szabo began guitar lessons with Bryon Martin when he was 11-years-old and Coleman began private drum lessons with famed drummer Mike Johnston when he was just 12-years-old. Hudson started singing in the 1st grade and decided by 6th grade that her career would be in music. McNay’s father, who played for the Montrose Frank Hannon Band, got him his first bass guitar, and after that McNay taught himself how to play and and has only been playing for the past three years. Hudson, who dedicates her spare time to working on music, graduated a year early from high school. Szabo and Coleman’s music relationship stretches back to when they were 12-years-old and in their first band Liberate together. Madison Hudson formed roughly a year and a half ago when Szabo heard through a friend of a friend that Hudson was looking for a guitar player. Hudson and Szabo started out doing acoustic music and began adding members, losing some along the way, now fulfilling their current image of a country cover band. The band covers artists such as Miranda Lambert, Sugarland and Lady Antebellum. “Craziest experience was at a show where there were guys break dancing in front of us – yes, breakdancing to country – so we brought them on stage in front of hella people and talked to them for a second. Then they started dancing onstage while we played then kept doing backflips off the stage. It was insane,” said Szabo. Coleman is also in favor of this transition to original material. “It’s cool working with originals because Madison will give us a song that allows us a lot of room to work with and be a part of the creative process,” said Coleman. Their next performance will be tomorrow at Goldfield trading post 1630 J St. downtown Sacramento at 9pm. Be the first to comment on "ARC students play in local country band Madison Hudson"